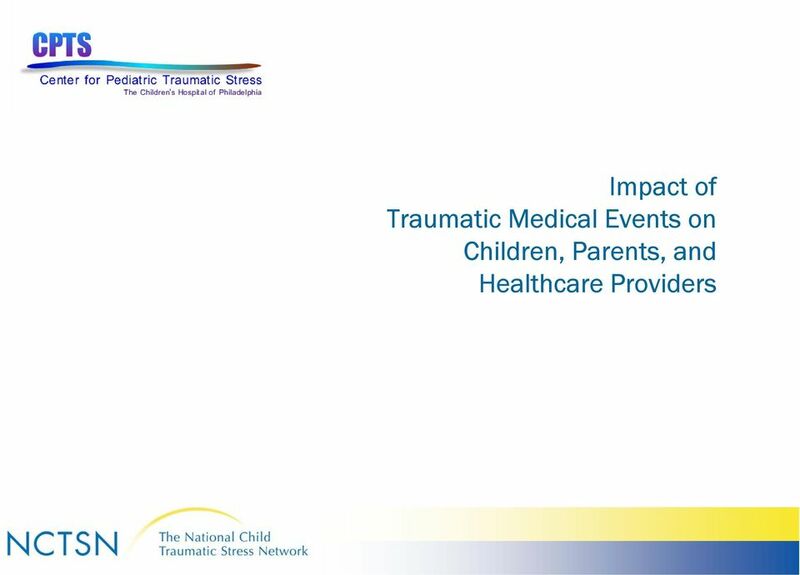 Download "Medical Events & Traumatic Stress in Children and Families"
2 Introduction Childhood injuries and illnesses are common: 5 out of 100 American children are hospitalized for a major acute or chronic illness, injury, or disability. 20 million children in the US each year suffer unintentional injuries, Over 11,000 children are diagnosed with new cancers each year in the US, and there are an estimated 250,000 children who are cancer survivors. More than 1,000 children have organ transplants each year and several thousand more are awaiting transplants These experiences can lead to traumatic stress reactions in children, their parents, and other family members. 5 Children s traumatic medical experiences I thought I was going to die. Thought I must really be hurt. I was so scared because my mom was not there. Doctors crowded around & stuck stuff on me & cut my clothes off -- I didn t know what was happening. It all happened so quickly. I was out of it and in pain. The ride in the ambulance was awful. I was given the first chemo treatment without being told what was going on that upset me for a long time after that. In the hospital, in the middle of the night they started pumping bright red stuff into me. They were wearing protective clothing -- that was pretty horrifying. Then I got sick a couple of hours after and I urinated bright red. There s nothing normal about that. 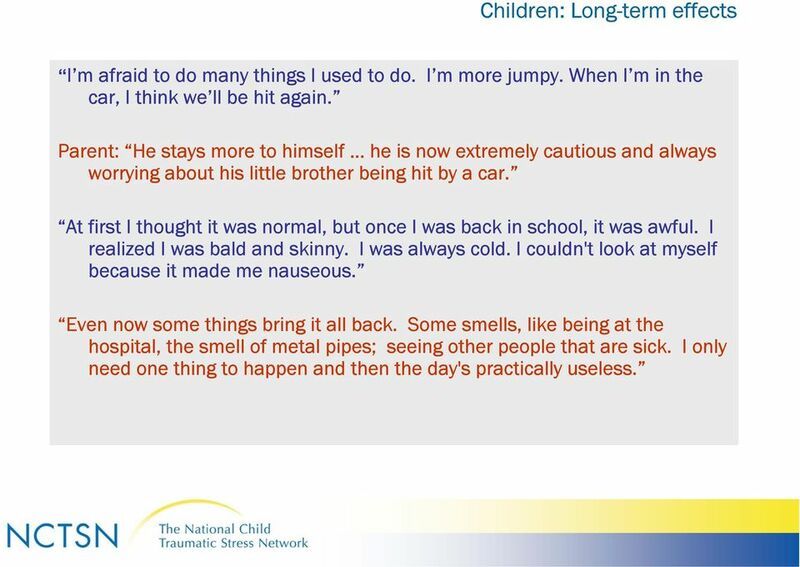 6 Children: Long-term effects I m afraid to do many things I used to do. I m more jumpy. When I m in the car, I think we ll be hit again. Parent: He stays more to himself he is now extremely cautious and always worrying about his little brother being hit by a car. At first I thought it was normal, but once I was back in school, it was awful. I realized I was bald and skinny. I was always cold. I couldn't look at myself because it made me nauseous. Even now some things bring it all back. Some smells, like being at the hospital, the smell of metal pipes; seeing other people that are sick. I only need one thing to happen and then the day's practically useless. 7 Parents traumatic medical experiences Father of a 9 year old child hospitalized after being hit by a car: I saw my son lying in the street. Bleeding, crying, the ambulance, everybody around him. It was a horrible scene. I thought I was dreaming. Mother of 3 year old child newly diagnosed with cancer: We went from taking him to our family doctor, thinking that he had some kind of virus or flu, to by the end of the afternoon being in the ICU and having him inundated with needles, and tubes, and Wow! How did the day end up like this? Parent report of the worst or scariest part of having your child in the pediatric intensive care unit: The simple fact that she is sick enough to be in the PICU is pretty scary, thinking I may lose her. 8 Parents: Long-term effects I still have a hard time driving by the hospital - reminds me of that time when she almost died. Every Monday I re-live it (parent of child who was struck by a car after school on a Monday) There s nights you lay in bed and awful thoughts run through your head. of them dying, you know, having a relapse. For a long time, we were so afraid of everything. We were afraid our son was going to die tomorrow; we were afraid he wasn t going to live a normal life. We were afraid he wouldn t be five he wouldn t be ten. 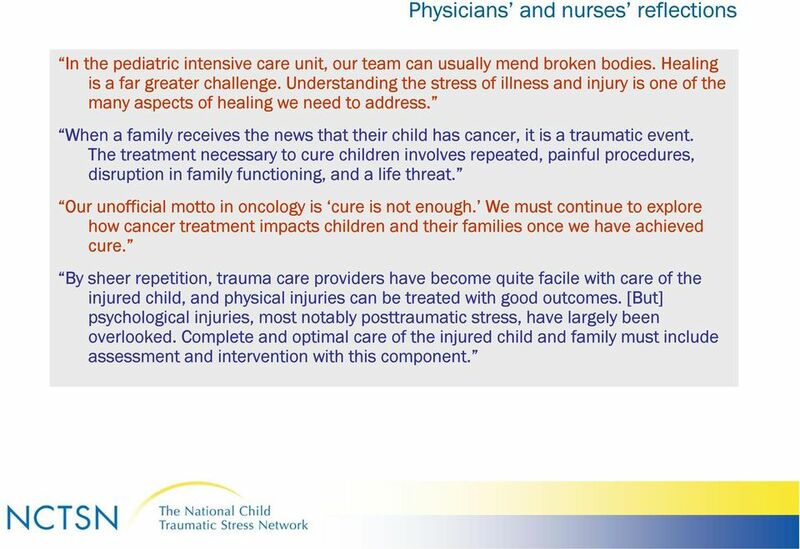 9 Physicians and nurses reflections In the pediatric intensive care unit, our team can usually mend broken bodies. Healing is a far greater challenge. Understanding the stress of illness and injury is one of the many aspects of healing we need to address. When a family receives the news that their child has cancer, it is a traumatic event. The treatment necessary to cure children involves repeated, painful procedures, disruption in family functioning, and a life threat. Our unofficial motto in oncology is cure is not enough. We must continue to explore how cancer treatment impacts children and their families once we have achieved cure. By sheer repetition, trauma care providers have become quite facile with care of the injured child, and physical injuries can be treated with good outcomes. [But] psychological injuries, most notably posttraumatic stress, have largely been overlooked. Complete and optimal care of the injured child and family must include assessment and intervention with this component. 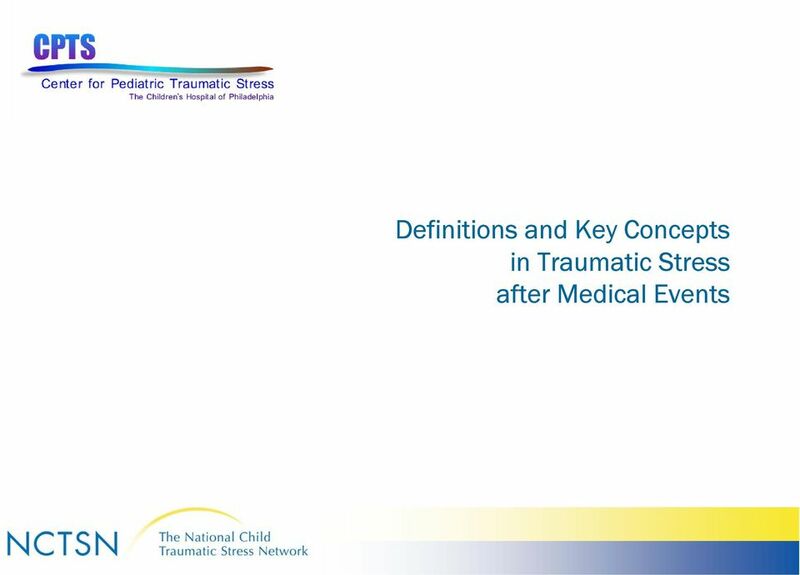 11 Definition: Pediatric Medical Traumatic Stress is a set of psychological and physiological responses of children and their families to pain, injury, serious illness, medical procedures, and invasive or frightening treatment experiences. 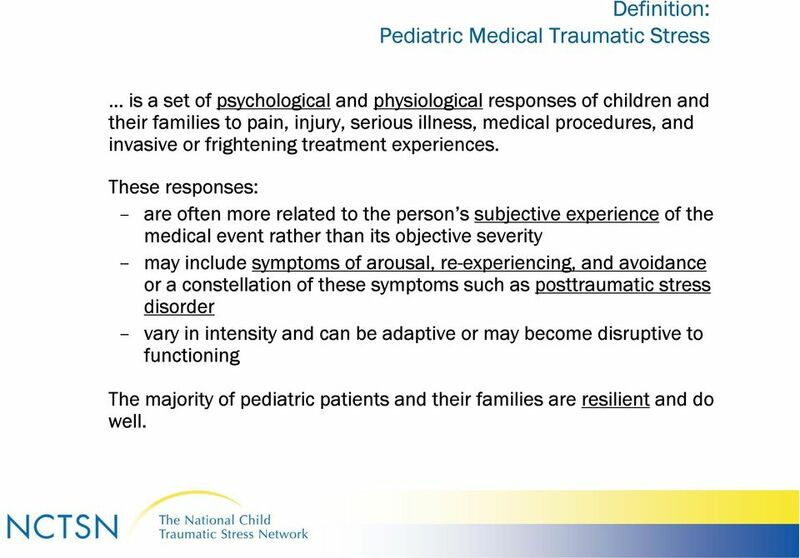 These responses: are often more related to the person s subjective experience of the medical event rather than its objective severity may include symptoms of arousal, re-experiencing, and avoidance or a constellation of these symptoms such as posttraumatic stress disorder vary in intensity and can be adaptive or may become disruptive to functioning The majority of pediatric patients and their families are resilient and do well. 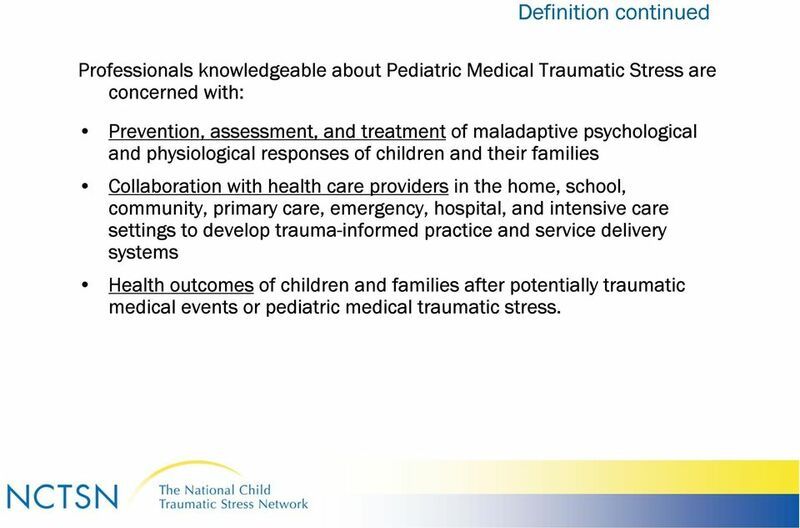 12 Definition continued Professionals knowledgeable about Pediatric Medical Traumatic Stress are concerned with: Prevention, assessment, and treatment of maladaptive psychological and physiological responses of children and their families Collaboration with health care providers in the home, school, community, primary care, emergency, hospital, and intensive care settings to develop trauma-informed practice and service delivery systems Health outcomes of children and families after potentially traumatic medical events or pediatric medical traumatic stress. 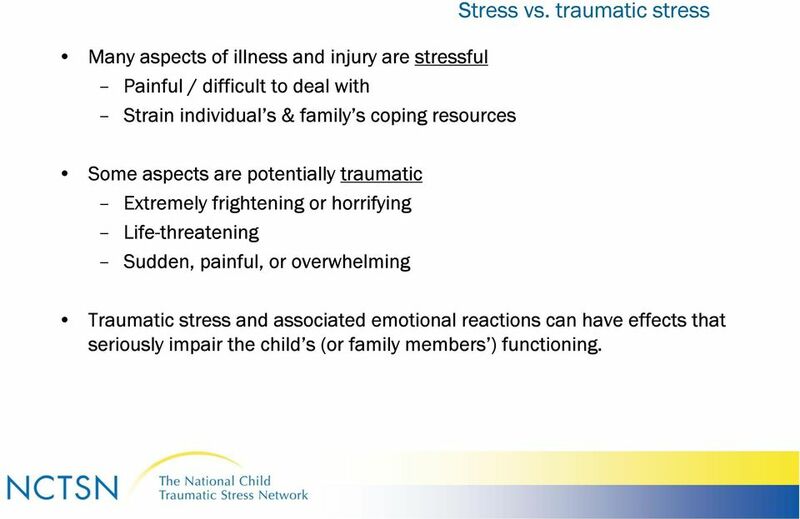 13 Stress vs. traumatic stress Many aspects of illness and injury are stressful Painful / difficult to deal with Strain individual s & family s coping resources Some aspects are potentially traumatic Extremely frightening or horrifying Life-threatening Sudden, painful, or overwhelming Traumatic stress and associated emotional reactions can have effects that seriously impair the child s (or family members ) functioning. 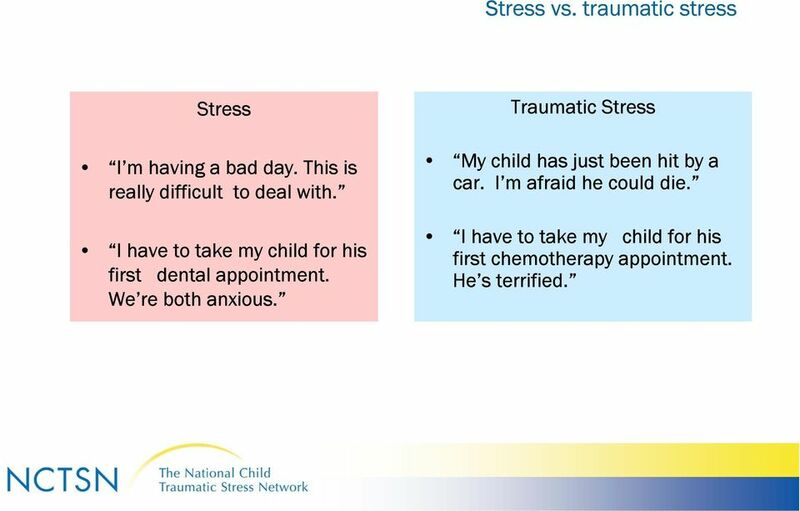 14 Stress vs. traumatic stress Stress I m having a bad day. This is really difficult to deal with. I have to take my child for his first dental appointment. We re both anxious. Traumatic Stress My child has just been hit by a car. I m afraid he could die. I have to take my child for his first chemotherapy appointment. He s terrified. 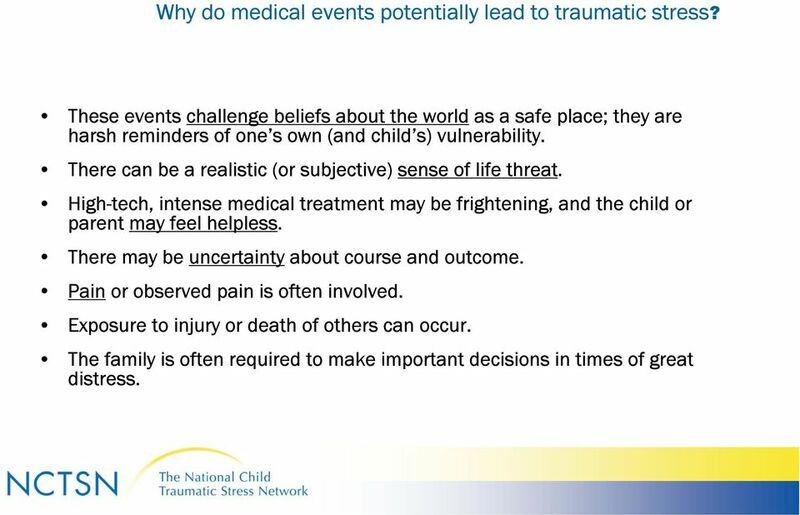 15 Why do medical events potentially lead to traumatic stress? These events challenge beliefs about the world as a safe place; they are harsh reminders of one s own (and child s) vulnerability. There can be a realistic (or subjective) sense of life threat. High-tech, intense medical treatment may be frightening, and the child or parent may feel helpless. There may be uncertainty about course and outcome. Pain or observed pain is often involved. Exposure to injury or death of others can occur. The family is often required to make important decisions in times of great distress. 16 Traumatic stress symptoms Re-experiencing It pops into my mind. Feels like it s happening again. I get upset when something reminds me of it. Avoidance I block it out - try not to think about it. I try to stay away from things that remind me of it. Increased arousal I am always afraid something bad will happen. I jump at any loud noise. I can t concentrate, can t sleep. Dissociation It felt unreal -- like I was dreaming. I can t even remember parts of it. 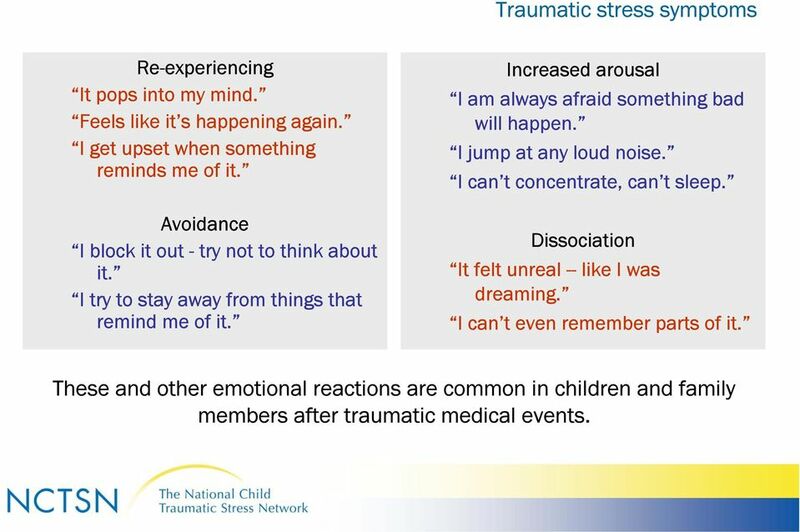 These and other emotional reactions are common in children and family members after traumatic medical events. 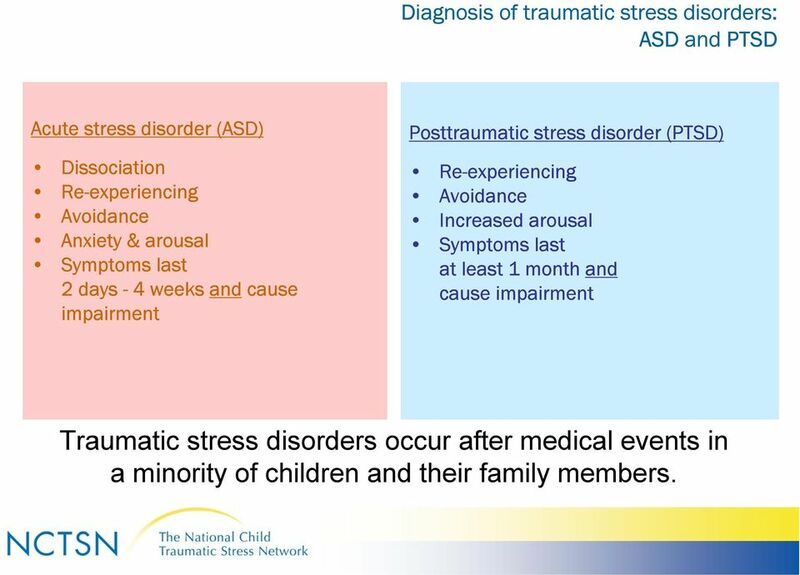 17 Diagnosis of traumatic stress disorders: ASD and PTSD Acute stress disorder (ASD) Dissociation Re-experiencing Avoidance Anxiety & arousal Symptoms last 2 days - 4 weeks and cause impairment Posttraumatic stress disorder (PTSD) Re-experiencing Avoidance Increased arousal Symptoms last at least 1 month and cause impairment Traumatic stress disorders occur after medical events in a minority of children and their family members. 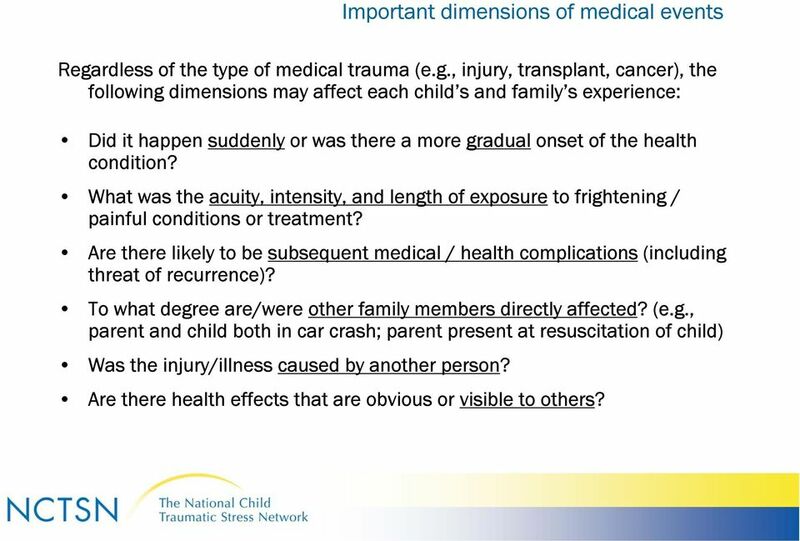 18 Important dimensions of medical events Regardless of the type of medical trauma (e.g., injury, transplant, cancer), the following dimensions may affect each child s and family s experience: Did it happen suddenly or was there a more gradual onset of the health condition? What was the acuity, intensity, and length of exposure to frightening / painful conditions or treatment? Are there likely to be subsequent medical / health complications (including threat of recurrence)? To what degree are/were other family members directly affected? (e.g., parent and child both in car crash; parent present at resuscitation of child) Was the injury/illness caused by another person? Are there health effects that are obvious or visible to others? 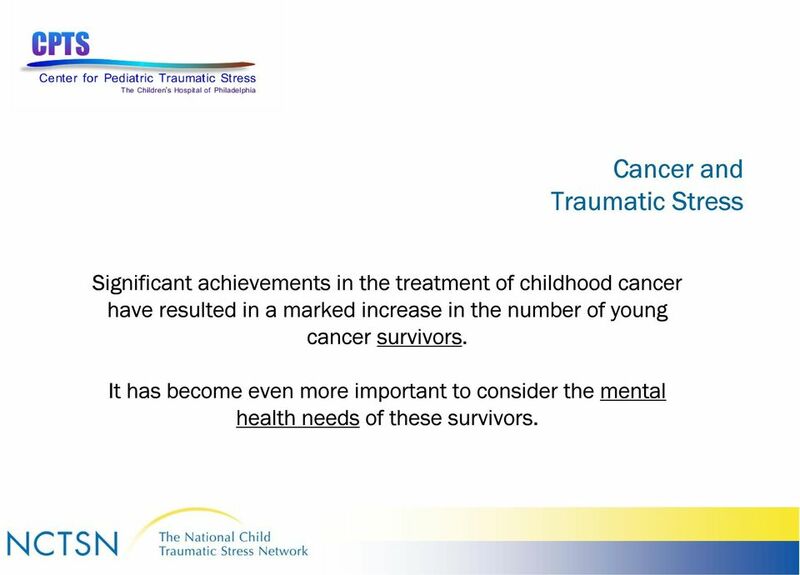 19 Cancer and Traumatic Stress Significant achievements in the treatment of childhood cancer have resulted in a marked increase in the number of young cancer survivors. It has become even more important to consider the mental health needs of these survivors. 20 Impact of cancer diagnosis Diagnosis of cancer: Is often surprising and life-threatening. Requires individuals and families to reorganize their lives and relationships. Forces individuals and families to deal with procedures and treatments which may be frightening, painful, and unfamiliar. Can create an ongoing psychological impact in the family, even after treatment ends, since the diagnosis of cancer and its treatment is not easily forgotten. May initiate a pattern of repeated traumatic exposures since ongoing medical surveillance is essential even after the initial treatment ends, due to late effects and the risk for second malignancies. 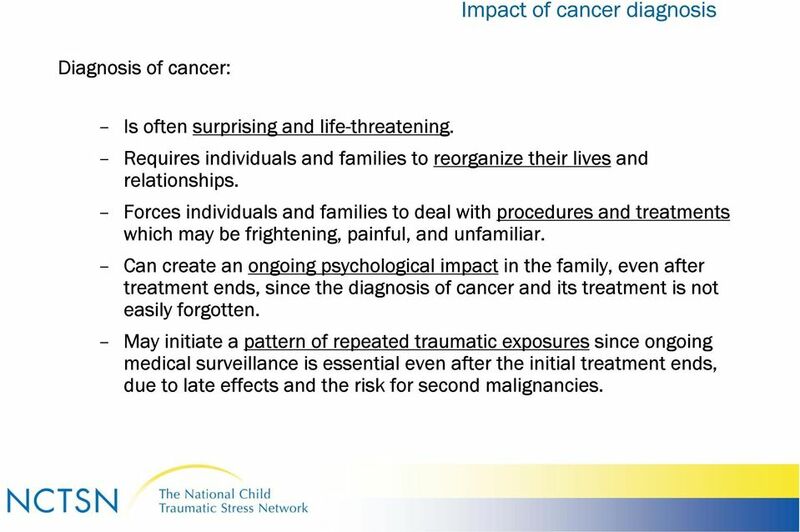 21 Traumatic stress in cancer: Critical junctures Time of diagnosis trauma may occur at time of diagnosis or during the beginning of painful and difficult procedures. During treatment- traumatic reminders or multiple traumas may occur with ups and downs of course of treatment, painful procedures, deaths of other patients, subsequent hospitalizations, etc. Post-treatment trauma response may be reactivated with threat of recurrence, other health concerns, deaths of others, developmental milestones. 22 Research findings on initial psychological responses to cancer Most individuals and families report some re-experiencing, arousal and avoidance traumatic stress symptoms in response to diagnosis and early treatment. Experiencing these post-traumatic symptoms is different from having posttraumatic stress disorder (PTSD). Studies show that most survivors of childhood cancer do quite well psychologically. However, studies also show that some cancer survivors and their families will experience continued distress from traumatic stress symptoms, even after cancer treatment ends. 25 Psychosocial intervention strategies during cancer treatment Reduce anxiety in children and families. Reduce child pain and distress. Help families seek out support. Pay attention to the impact of treatment-related events (e.g., ICU admission, death of another patient). Help families develop strong alliances with health care providers. Providers should talk with children and families about the likelihood of ongoing reactions and feelings after treatment ends. 27 Injury and Traumatic Stress Injury, a leading health threat to children, is also a common cause of posttraumatic stress in childhood. 28 Impact of pediatric injury There are many potentially traumatic elements of pediatric injury during the event and afterwards. Injury events are often sudden, painful, and potentially life-threatening. Injury can occur from intentional and unintentional sources, which have different traumatic elements and meanings for the affected individuals. The immediate aftermath of injury may have additional traumatic stressors including aspects of the emergency medical setting and subsequent treatment. 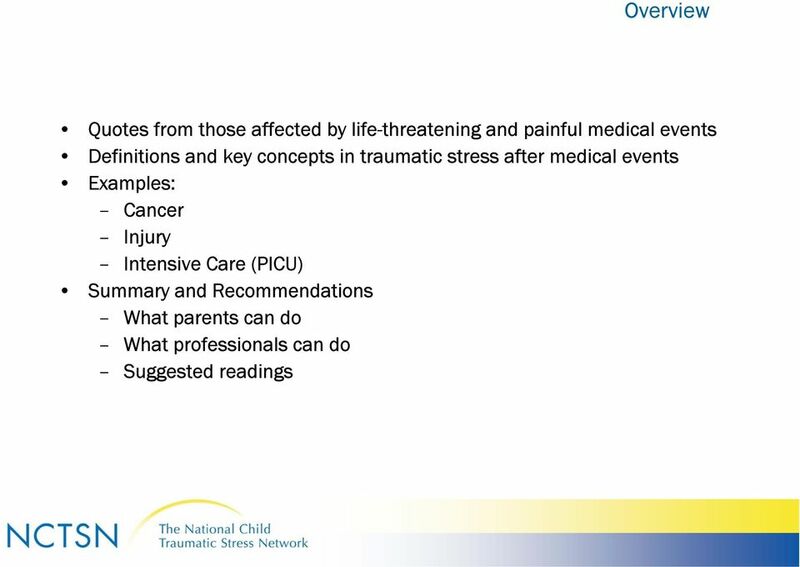 29 Traumatic stress after injury: Critical issues There is a need to identify those at risk for developing traumatic stress disorders (PTSD) after injury. Injury severity is not a good indicator of PTSD risk; there is a need for other empirically-validated risk indicators. Time constraints in emergency and acute care preclude in-depth assessment of emotional status of all injured children. (Recent studies indicate that brief screening of ASD symptoms and other risk factors can be useful.) There is a need for practical, effective ways to screen in the emergency and primary care medical settings, since children and parents rarely seek mental health assistance, but may receive urgent and follow-up health care. 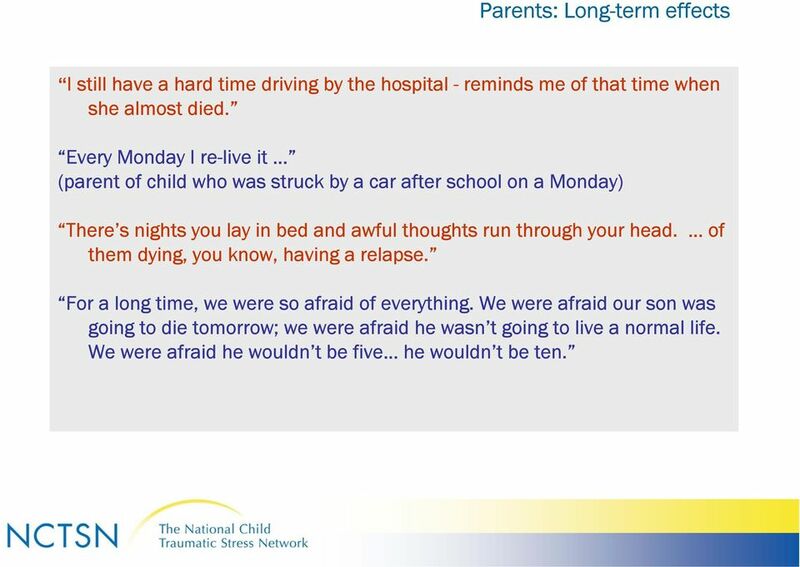 32 Family experience of traumatic stress after injury Research findings suggest that: Parents are key resources for their child s emotional recovery after a traumatic injury. Parent and child reactions to injury are connected -- severity of ASD or PTSD symptoms is correlated between child and parent. It is often hard for parents to assess their child s psychological responses to injury. Parents may under- or over-estimate their child s distress compared to their child s own report of symptoms. 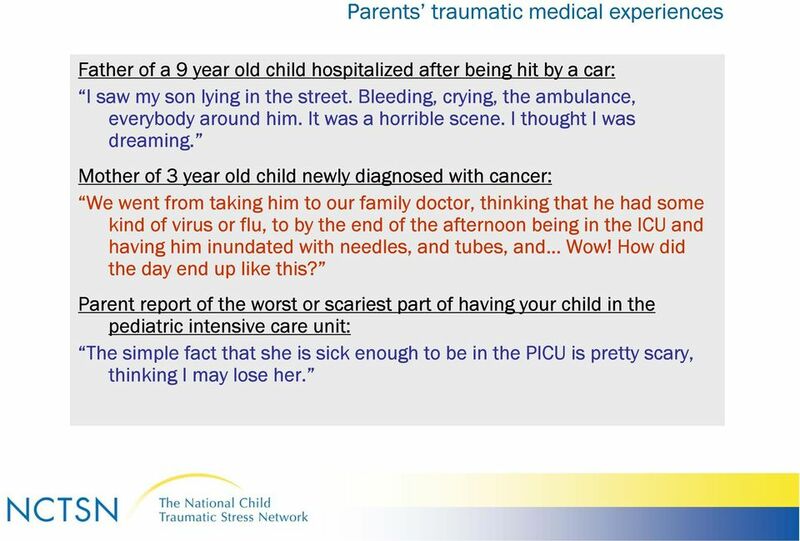 35 Pediatric Intensive Care Unit and Traumatic Stress Admission of a child to the pediatric intensive care unit (PICU), provides exposure to many potentially traumatic stressors. 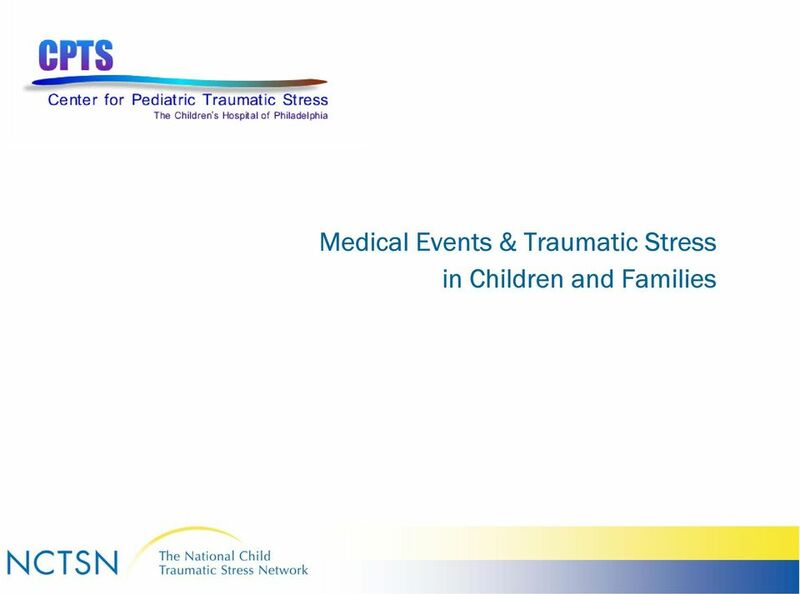 36 Traumatic stress in the PICU: Impact and critical issues Traumatic aspects of having a critically ill child admitted to the PICU may include: Acuity and urgency of child s health condition Multiple medical procedures and complex technologies Potentially frightening sights and sounds Patient s (and other s) pain or suffering Death, bereavement, and end of life care decisions Subjective perception of the risk of a child s death, and not objective criteria, is associated with traumatic stress outcomes. 37 Research findings on psychological responses to the PICU After admission to the PICU, studies have documented: Traumatic stress symptoms - many parents have at least a few traumatic stress symptoms initially In a recent study, a majority of parents reported clinically significant symptoms in each of the ASD symptoms categories. 1 Traumatic stress disorders In a recent study, 1 in 5 parents developed PTSD about 3-6 months after their child s PICU admission. 1 Changes in parent-child relationships and family functioning Child traumatic stress reactions to intubation 1 Balluffi, Kassam Adams, Kazak, et al (under review: Pediatric Critical Care Medicine). 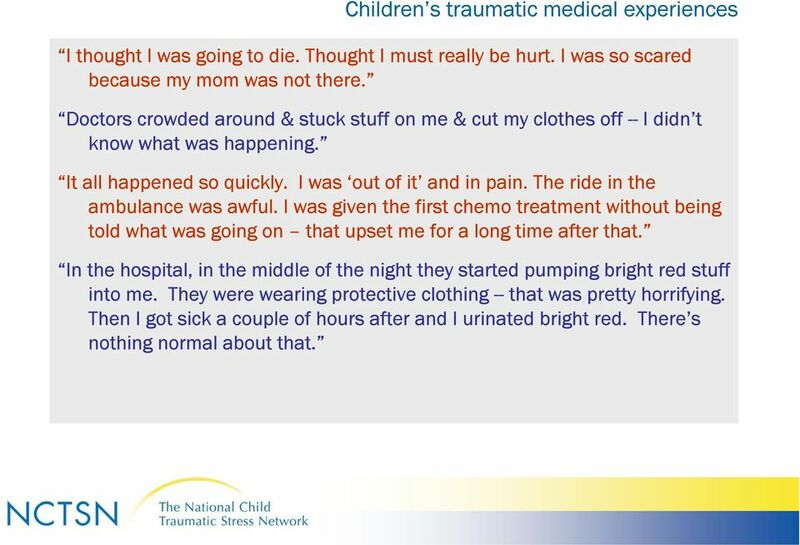 Traumatic stress in parents of children admitted to the pediatric intensive care unit. 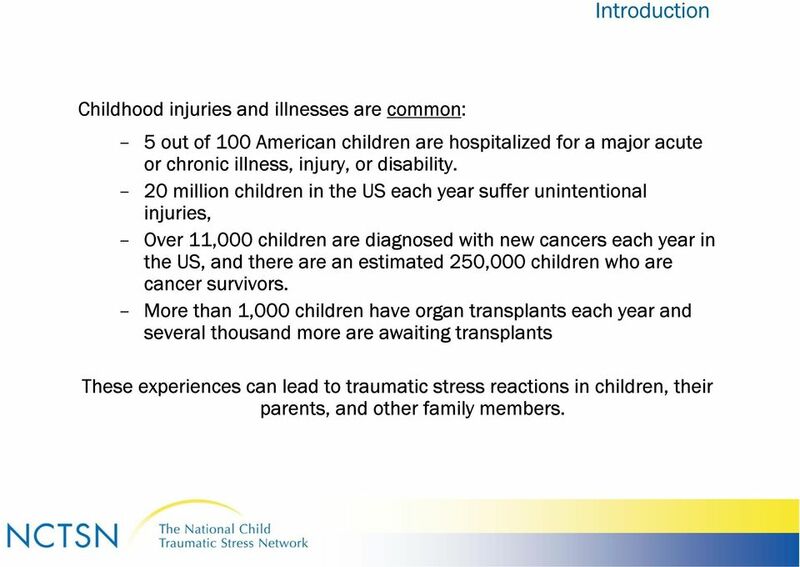 40 Summary Pediatric illness and injury experiences are potentially traumatic: Children and parents often feel frightened, helpless, vulnerable Family functioning is disrupted and coping capacity is challenged Many children and their family members experience some traumatic stress symptoms. A smaller number experience more severe and persistent PTSD symptoms. Promising models for screening, prevention, and treatment of posttraumatic stress in the health care setting are being developed. 42 Promising interventions from the Center for Pediatric Traumatic Stress Prevention Preventive interventions are now being developed for children who have experienced a traumatic injury. Treatment Surviving Cancer Competently Intervention Program (SCCIP): An empirically-supported cognitive-behavioral and family therapy intervention program for families of a pediatric cancer survivor. 1 This treatment is currently being adapted for newly diagnosed families. Interventions are under development for families of children admitted to the pediatric ICU. 1 Kazak et al. (under review: Journal of Family Psychology). Treatment of posttraumatic stress symptoms in adolescent survivors of childhood cancer and their families: A randomized clinical trial. 43 What health care professionals can do Provide information and basic coping assistance for all children & families facing potentially traumatic medical experiences (illness, injury, painful procedures). Promote early identification and preventive interventions with children & families who may be more vulnerable to posttraumatic stress. Refer high-risk families and those with persistent traumatic stress symptoms for mental health assessment and intervention. Further educate yourself through continuing education, reading professional literature, and consultation with knowledgeable colleagues. 45 What parents can do You can help your child deal with a frightening illness or injury by: Gently encouraging your child to talk about the illness / Injury / treatment and his/her reactions to it. Answering your child s questions -- and listen for unspoken worries or fears. Supporting your child in participating in normal activities (school, friends) as much as possible. Asking for help if your child s reactions worry you. If talking about this makes you tense or upset, get support for yourself, so you can help your child. Educate yourself through talking with a healthcare professional or reading (see list of suggested materials). Caregiving Issues for those with dementia and other cognitive challenges. Overcoming the Trauma of Your Motor Vehicle Accident Chapter 1 Introductory Information for Therapists Case Study: Mary The day had begun like any other. Mary was on her way to work early in the morning. Suicidal. Caring For The Person Who Is. Why might a person be suicidal? Taking Care: Child and Youth Mental Health ANXIETY WHAT IS IT? Kids Have Stress Too! Especially at Back to School Time As a Parent, You Can Help! Coping with trauma and loss Coping with trauma and loss Someone close to you may have died in sudden and/or traumatic circumstances. You may have witnessed the death, or the deaths and injury of others. Living with dying Patients and carers experiences of living with lung cancer Dr Donna Fitzsimons, Lesley Rutherford & Jill McAuley Study Aims To explore the experiences of patients living with lung cancer. 9/11Treatment Referral Program How to Get Care Health 9/11 Treatment Referral Program The 9/11 Treatment Referral Program was created to help enrollees and others find care for WTC-related health problems. What is Narrative Exposure Therapy (NET)? Traumatic brain injury EMOTIONAL AND BEHAVIOURAL CONSEQUENCES OF HEAD INJURY Traumatic brain injury (TBI) is a common neurological condition that can have significant emotional and cognitive consequences. Anxiety Disorders. What are anxiety disorders?